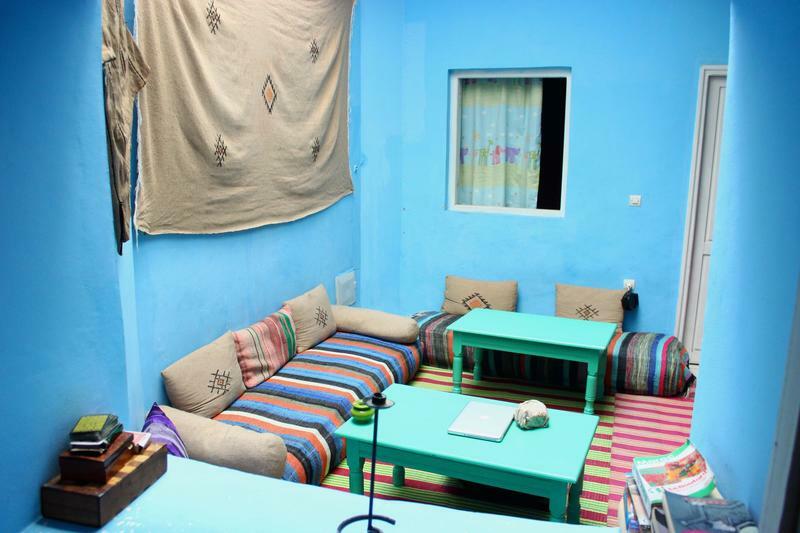 The newest hostel in the Centre of the Medina, a 4 minute stroll to the beach, and close to the the souqs and street markets, Cloud 9 provides exactly what the adventurous traveller is looking for: a warm atmosphere, a space to meet fellow travelers, clean and comfortable rooms, free Wi-Fi and the promise of new experiences in laid back Essaouira. We want you floating on Cloud 9, and aim to uplift you to a state of easy bliss. Experience it on our airy rooftop terrace, or lazing on a couch under our traditional Berber tent. Our staff come with open minds and open hearts, and are ready to welcome you to our home in the clouds. Cloud 9 offers: mixed dorms, girls dorms, private rooms (twin / double / triple). Enjoy our free Wi-Fi and hot showers. 1. If you arrive at the main bus station, go to the BAB DOUKKALA entrance of the main medina. Walk through the gate and straight down AVENUE ZERKTOUNI, until you get to the second arch (there is a mosque, Sidi Ahmed, on the left of the arch). Turn left on RUE MOHAMED EL QUORI and keep walking until you get to the forth street on your right (RUE D'ALGERIE). 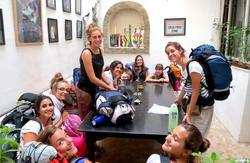 Hostel CLOUD NINE is the second door on your left (number 16, next to Lalla Mira). 2. 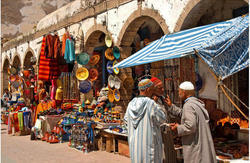 If you arrive at the Supratours bus station, go to the BAB MARRAKECH entrance of the main Medina. Walk through the gate and straight down RUE MOHAMED EL QUORI until you reach the second street on your left (RUE D'ALGERIE). Hostel CLOUD NINE is the second door on your left (number 16, next to Lalla Mira).